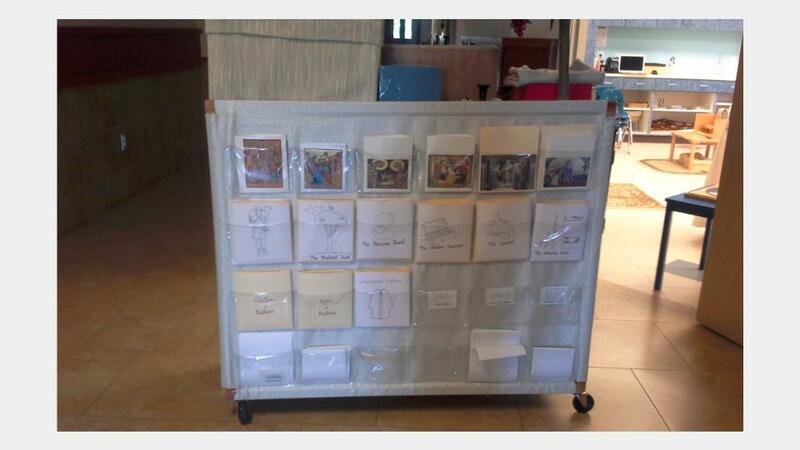 Catechists are quite creative when faced with challenges in establishing their atria and making materials. The complete unit stands 6 feet high and comes with adjustable shelves. Sister Theresa Josephine did not use all the shelves provided, so her cart stands about 4 1/2 feet high. She replaced the wheels that came with the unit with a sturdier set. The back of the shelving unit holds tracing packets mounted on a wooden frame. Nylon cable ties hold the wooden frame to the back of the cart. Velcro strips keep the covering in place on the shelving unit. 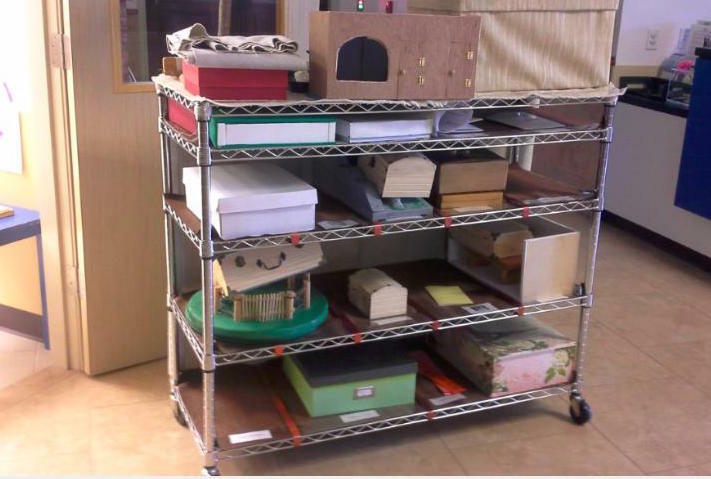 Sister Theresa Josephine An Do, O.P., a CGS catechist in Houston, Texas, bought this free-standing wire shelving unit from a home improvement store. She does not have dedicated space for an atrium, but travels from classroom to classroom with her materials. This page describes her shelf in more detail. Each wire shelf has a thick cloth lining, and Sister used ribbon dividers to accommodate the size of the materials. She placed labels identifying each material at the front of the shelf and covered them with a flap of clear plastic. Pouches have picture/name labels to aid in restoring the packets correctly. When Sister Theresa Josephine is not using the cart, she covers it with a cloth. Thank you, Sister Theresa Josephine, for sharing your wonderful idea! May God bless your work! Do you have ideas? Contact us by clicking here!